We now have a great way for you to start supporting our organization today! 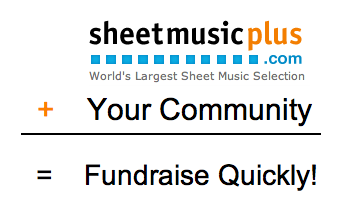 When you shop with Sheet Music Plus, 8% of your purchase will go towards helping us raise money for _____________________; all at no cost to you! Let others know about the program -- grandparents, friends and alumni -- so we can reach our fundraising goals quickly. Thank you for your consideration and continued support of our organization.